1 of 3 Bring 1 cup farro plus 1/2 tsp salt and 2 1/2 cups water to a boil, then simmer 25 to 40 min. Drain excess water. 2 of 3 On a rimmed baking sheet, toss cauliflower with 3 tbsp olive oil and 1/4 tsp each salt and freshly ground black pepper. Roast at 450 degrees for 25 min, turning halfway through. 3 of 3 Meanwhile, finely chop parsley and grate garlic. Zest and juice lemon. Stir parsley, garlic, zest, juice and hazelnuts with 2 tbsp olive oil; season with salt and freshly ground black pepper. 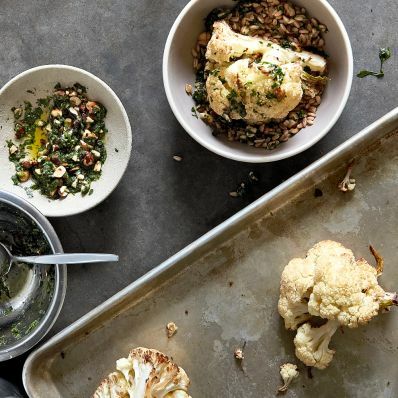 Serve cauliflower over farro and top with gremolata.